People often ask, " Laurel, let's say you are about to be stranded on a deserted island, your canoe is sinking, and you have to swim to shore. You have 1 minute to grab your swim fins, snorkel, some garden tools, books, shades, some wine, your dog, a few CD's and 20 tomato seed varieties from among the hundreds you always have in your pockets. Which ones would you choose?" "How about 30? ", I always reply. (H) Hybrid. The few hybrids we list were developed with great flavor as the main criterion. These are delicious varieties which we have grown and taste-tested to ensure superior flavor. (D) Determinate. Also known as 'bush' varieties, these plants are great for container growing or for your small garden. They reach a certain predetermined height and then stop growing. Most of the fruit is borne over a 4 to 6 week period. A specialty plant, developed to produce consistently in very hot weather, up to 97º- 98º. Our Penguin Symbol means this variety grows beautifully in all climates, and does especially well in cooler temperatures and produces late into the cool season. Grows beautifully in most climates and is extra cold tolerant. However, this does not mean North Dakota in winter. Your tomato plants need night temperatures consistently above 50º F.
(E) Early ripening variety, with 78 days or less to ripe tomatoes. (VE) Very early varieties, usually less than 68 days from plant-out to ripe fruit. (EE) Extremely early ripening varieties, ready to pick in only 45-60 days from planting. A good choice for growing in pots, and a variety which Laurel has already grown successfully in containers. Any heirloom tomato plant will grow well in a large 18 - 30 gallon container with proper growing techniques and the dwarf varieties can be grown in 5 -10 gallon containers. (Ch) A cherry tomato. These little fruits can be red, black, orange, pink, purple, green, yellow, ivory, white or bicolor and in varying shapes: round, pear, grape, ping pong, pea-sized and plum-shaped. (B) A big tomato of at least 1 or 2 pounds. (BB) A really big tomato. These 'super braggers' can reach 3 to 4 pounds. (BBB) A ridiculously huge tomato, these prize winning giants can reach more than 5 lbs. (SM) A small plant, great for containers or smaller garden spaces. (VSM) A very small, dwarf type plant for small containers and tiny gardens. (P-S) Paste or sauce type, especially popular for sauces. These tomatoes are richly flavored, ideal for cooking because flavors increase exponentially during the cooking process, and are also marvelous for fresh eating. (HG) For your Historical or Heritage Garden. These are storied tomatoes with a fascinating history, including well-known historic varieties, some of them named after persons of high renown, or an historical event. Some are tomatoes with tall tales and legends attached to their names. Many have simply stood the test of time. Days: Approximate time from planting the seedling to harvesting the ripe fruit. Can vary from climate to climate. New for 2015! This means we are offering these varieties this year for the first time. Not necessarily a 'new' variety. Paul Robeson ($6.50) (VE) (HG) 65-70 days. This is my all-time favorite tomato and our top seller. New New for 2017! Laurel's Top Pick! My absolute favorite discovery this season! These big hearty tomatoes are heavy-in-the-hand and grow in clusters of 3 or 4, each weighing 10 oz. to 2 lbs. and have the depth of flavor and fragrance we hope for in our tomato gardens. Sweet, rich and meaty with silky texture and incredible flavors, I am tasting one as I write this--right now--true story. Sweet! Wow. This tomato is fabulous! Really heavy! Full of juice. I didn't even slice it, my 20 yr. old grandson Stevie Ray is horrified! I'm eating it like an apple, juice running down my neck and my arms. He yelled "watch out for your keyboard!" Amy's Sugar Gem ($6.25) (VE) 65 days. This huge, sprawling plant produces heavy clusters of golf ball sized, incredibly delicious, deep red ambrosial fruit with tiny golden jewel-like sparkles within the red skin. Very sweet! It was one of my absolute favorite tomatoes at TomatoFest in September of 2009--just knocked me out. Candy-on-the-vine, not to be missed. This luscious little sweetie is a cousin of Purple Haze, yet this one grows tomatoes that are twice the size. Not a cherry, tomatoes this size, 2", are called saladette. A very heavy producer with clusters of 6 to 10 tomatoes. I've been hearing about this extremely rare fruit lately in heirloom tomato circles--everyone wants it! We've got it! From Lisa VonSaunder, "A fabulous tomato in every way you can measure. A huge tomato with some of the most outstanding flavors I've ever known. I never saw tomato plants grow so large so fast. Huge plant with stems like tree trunks. The first tomatoes of the season were one pound, then the fruit started coming in larger and larger and larger until they were the largest of all my tomatoes this season. Fabulous deep, rich, pink fruit that beat all the others in taste. Photograph by Lisa VonSaunder of Amishland Seeds, used here with her kind permission. Berkeley Tie Dye ($6.50) 80 days. This rare and exotic fruit with big, bold, luscious flavors looks just like its name implies with spectacular showy streaks and swirls of green and yellow, red and orange, with green and red patterning inside and out. From 8 to 12 ounces, chefs nationwide are ordering these plants for their restaurant gardens -- tomato lovers are clamoring for this fabulous variety. 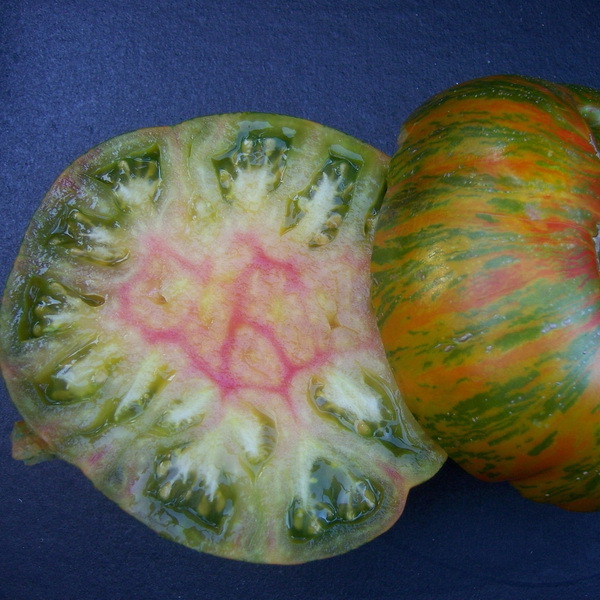 Berkeley Tie Dye is another fabulous variety from talented tomato breeder Brad Gates of Wild Boar Farms here in California. Photograph used here with the kind permission of Brad Gates. A portion of the proceeds of Berkeley Tie Dye will be donated to TACA, Talk About Curing Autism, in the names of two very handsome, winsome young fellows. Aunt Ruby's German Green ($6.25) (B) (E)75-78 days. You're going to love this beautiful Tennessee tomato. Big, sweet beefsteaks, bursting with a fragrant, complex, spicy-sweetness with a touch of tang. A gorgeous green-when-ripe color, this much sought after variety is a real treat to have in your garden, and is said to be the very best tasting green. Reaching an average of 1 lb, Aunt Ruby's German Green grows in clusters of 2 or 3. With its intricate, earthy, unforgettable flavor, this one will broaden your tomato horizons. Very adaptable, and easy to grow with good disease resistance. From Ruby Arnold of Greeneville, Tennessee who passed away in 1997. Black Krim ($6.25) 75 days (E) This much sought after Russian variety is unique and unforgettable, originally from Krim on the Black Sea in the former Soviet Union, Black Krim has a superb smoky sweetness with a delicate lingering touch of tang in a 4-6" slightly flattened, mahogany-colored fruit with lovely, deep green shoulders. Just superb and very easy to grow. It arose about 5 years ago in the garden of Elser's Country Farm in Yucaipa, California and they have been selling it to adoring customers at their Southern California heirloom tomato farm stands for several years. The flavor is tantalizing--tart and sweet, a perfect combination of tang to sweetness with plenty of juice and a rapturous brown and green color. When Amazing Terry and I first tasted it in August, our eyes got wide, we grinned and stared at each other with the 'Oh-my-God-this-is-incredible' look. I could barely believe my mouth. Elser's Brown Derby has become a much sought after favorite at Maria and Darrell's Farmer's Market stands where customers arrive early to get their hands on one of these treasures. I had to scramble to get this one. True story. I picked it up, another customer begged me for it; I did not budge, wouldn't give it up. I wanted it for the photograph because it was so beautiful. Then we ate it. A Laurel's exclusive. Brandywine OTV ($6.25) (B) (E) 72 days. A truly marvelous stand-out member of the great family of Brandywines, this one arose in Craig LeHoullier's garden years ago. Big one-pound red fruits with orange shoulders and complex rich flavors. An outstanding tomato for your garden; it also sets fruit very well during high temperatures and bears all season. A reliable producer, very disease resistant, and easy to grow; OTV stands for Off The Vine, which was a wonderful online tomato newsletter published by Carolyn Male and Craig LeHoullier. They describe this tomato as "the best strain of Brandywine set apart from others by its smooth, creamy, almost buttery texture, and harmonious sweet flavor." It originated from a natural cross-pollination of Yellow Brandywine and an unknown red parent, and was further developed and stabilized by Carolyn Male. Carmello ($6.25) (E) 75 days. 75 days. An extremely popular French tomato. This one is highly sought after and has become a great favorite among my customers. A very reliable and bountiful producer of heavy, juicy, 8 oz. red fruits with immense flavor, this plant is among the most prolific ever bred, and produces so many fruits, you will be giving them away by the basketful. The Carmello plant in my garden proved to be disease resistant, and produced through late December with night temperatures about 42 degrees. The flavor alone puts it in my top 10. Wait 'til you see all the tomatoes on this plant; bring the big harvest basket. This is the open pollinated heirloom version of Carmello, NOT a hybrid. It as de-hybridized by Gary Ibsen many years ago. Soon I began getting calls from customers who loved it and begged me to send them another Druzba! I think you will agree that it has a very robust, rich, concentrated tomato flavor borne in smooth, perfectly round, deep-red, blemish-free 10 ounce fruits with good disease resistance and high production. This rapturous little cousin of Purple Haze is the newest addition to our heirloom tomato selection. My seeds for this exquisite 1” deep purple cherry tomato come from Dana Ferrin of Seattle, who grew out the Original Purple Haze for four generations to see if it would grow true-to-variety. He sent me some seeds to grow out and to our delight, the resulting fruit is a half-sized, full flavored, sweet and sassy little 1 oz. cousin to Purple Haze which I’ve named Foxy Lady. The flavor, very much like Purple Haze, is energizing, elaborate and dazzling with a sweet, seductive background of earthy nuance and lingering flavors. I was mesmerized by the flavors of these little cute little heartbreakers in my garden. Early ripening and growing in mass abundance on big plants in clusters of 5 to 7 fruits, Foxy Lady ripens in only 70-72 days from plant out. Unlike the regular-leafed Purple Haze, Foxy Lady has some of the biggest potato type leaves I’ve ever seen. They'll make you wanna get up and scream... and just like the Original Purple Haze, which is also available for 2012, (see below), Foxy Lady has a muted, subtle saltiness along with a tiny touch of tang to balance its big full-bodied sugar. You’ve got to be all mine, all mine…. Dana has donated seeds so we can grow and offer this very rare plant to our customers and donate part of the proceeds to TACA, Talk About Curing Autism. www.talkaboutcuringautism.org. Thank you, Dana! Supply is rather limited, please order early. A Laurel's exclusive. This delectable historical family heirloom is one of the rarest plants we offer and our top seller. The flavor and color run deep in Goose Creek, a stunning, hot reddish/pink fruit; I'd call it garnet or scarlet. The fruits are usually round or slightly flattened, occasionally lobed, some with tiny gold streaks or speckling. The seeds of this sublime fruit have been passed down through generations when Jimmy's great-great grandmother, a young Caribbean slave, smuggled them with her aboard ship. When the ship docked at Charleston near Goose Creek, South Carolina, she had the treasured seeds with her, hidden in her skirt pocket and planted them that first spring. Jimmy's grandmother, Elouise Watson, shared this precious heirloom with him more than 55 years ago, assuring Goose Creek's place in his family's garden for generations to come. NOTE: This is the original Goose Creek. You may see seeds for sale in various places. Most are not the real Goose Greek. Call me if you want to know! Hawaiian Currant ($6.25) (Ch) 80 days. This magnificent miniature morsel of a tomato amazed me and the other tasters at TomatoFest in September of 2003. Festival guests were going back for more, causing a traffic jam in the joyous meandering line of tomato fans. It grows in abundant grape-like clusters, each cluster holding onto its little red pea-sized fruits, until all are perfectly ripe. Be sure to pick the entire cluster as you would with grapes, rather than trying to get these teeny little guys off one at a time. Photograph of Hawaiian Pineapple is the property of Dianna Theyssen and used here with her gracious permission. Japanese Black Trifele ($6.25) (SM) 80 days. Japanese Black Trifele, which translates to truffle, is a big juicy 8-10 ounce pear-shaped, deep purple-black tomato with pretty green shoulders. In Russia the Trifele varieties of tomatoes--of which there are several colors--are highly prized and command high prices. Growing on a short potato-leafed plant, it's the size and shape of a Bartlett pear and among the darkest hued and finest flavored of the black tomatoes. The skin is smooth and crack resistant and production is huge. Flavor is deep, chocolaty, smoky and rich, just wonderful. Jutland ($6.25) (E) 70 days. (Pronounced Jut-land or Yoot-lahn) This is my new 'go to' variety for the best dang tomato for BLT's and any fresh eating. A perfect 3 to 5 ounce, thin-skinned, plum shaped, brilliant red tomato, some smooth, some with a pointed tip and the most sublime flavor we've found in a tomato this season. I keep saying " Where have you been all my life?" It appears in several different shapes on the same plant -- some very elongated, some short and plump, and, as with many tomatoes of this shape, the foliage is rather wispy. Sliced into 'coins' or halved lengthwise, it is my new favorite for salads, sandwiches and cooking. True story. Juicy, sweet, tangy, delicious, thin, very tender skin and old-fashioned tomato flavor make Jutland a must-grow for the most dedicated and adventuresome heirloom tomato fans. Stephanie Madziak contacted me in 2014 about this fabulous tomato hoping to share it with other heirloom tomato gardeners. She's been growing Jutland for about 15 years since she collected a few seeds at a local tomato-tasting festival and fell in love with this sublime fruit. She tells us: "The seeds were first collected at Howell Living History Farm in New Jersey. For a couple of years, they had a small tomato festival where you could bring your best tomatoes and compete for best flavor, etc. I collected them there, after sampling a sliver that I loved!It was labeled 'Jutland tomato from Harbourton' NJ." Kellogg's Breakfast ($6.25) (E) 78 days. Wow whatta tomato! These big 1 to 2 lb. bright orange beefsteak beauties are exactly the color of orange juice. Thin skinned and with very few seeds, this terrific fruit with its sweet, buttery, ambrosial flavor with a perfect balance of bright tanginess is a favorite of gourmets and gourmands worldwide. Sliced open, it reveals a rich creamy bright-orange flesh, just bursting with juice. A top seller year after year. Seeds originally saved by Darrell Kellogg of Redford, Michigan. Thank you, Darrell. Marianna's Peace ($6.25) 80 days. (B) (HG) One of our top 3 sellers. 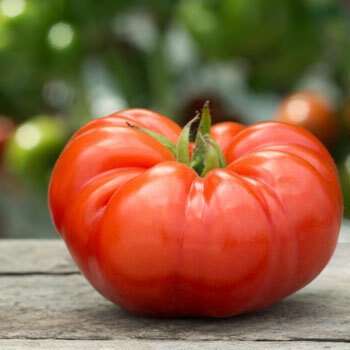 The sugary nectar of this huge 5 inch tomato's creamy, dense, red flesh is intensely rich, with perfect sweet-acid balance and sublime, complex flavors reminiscent of the finest of the "old-fashioned" tomato flavors. This big, beautiful irresistible 1-2 lb. deep red fruit is the talk of the tomato world and has found its way into Top 10 favorite tomato lists of gourmands worldwide. It is perfection. Supply is limited, please order early. It is said that Marianna's Peace is among the 3 finest tasting tomatoes in existence. Marianna was from a family of farmers in Bohemia, Czechoslovakia. During World War II, in May of 1945 when she was 17, Russian soldiers came to her school and forced Marianna and all her schoolmates into a truck to be taken to Siberia. During the journey, she and a few others escaped by jumping from the moving truck, but Marianna was shot in the leg just as she crossed the Czech border. With the help of her friends, she was able to continue on to the town of Weiden, Bavaria. She lost all contact with her parents and brothers for the next ten years, but after a long and diligent search with the aid of The Red Cross, she finally found them in 1955. Before he died, her father gave her a little bundle of the seeds. Marianna married, and in 1957 moved to Washington State with her husband where they raised four children. The legacy of these seeds reaches back to the early 1900's and year after year the tomatoes borne from this marvelous heirloom continue to be treasured for their outstanding taste and beauty. Incredibly sweet, creamy, with dense red flesh, rich and luscious, reminiscent of the finest of those "old-fashioned" tomato flavors, the memories of which are the stuff of dreams for all tomato lovers. Omar's Lebanese ($6.25) (BBB) 80 days. The big tomato from Lebanon! Omar's Lebanese has a passionately sweet and complex flavor. These immense fruits--deep dark pink and juicy--grow to 3-4 lbs, with excellent disease resistance. A spectacular tomato. Really easy to grow, out of this world. Takes 2 hands to pick it. In my top 5. Many of the Eastern European tomatoes have gigantic flavors. This one is especially fabulous. Ruby Gold (Sometimes called Gold Medal) ($6.75) 85 days. Sunset's Red Horizon ($6.25) (B) (E) 72 days. This outstanding big, red, ambrosial and glorious fruit is, along with Purple Haze, Marianna's Peace, Vintage Wine, Green Giant, Goose Creek, and Earl's Faux, the talk of the tomato world this season and being described as the best tasting tomato in existence. 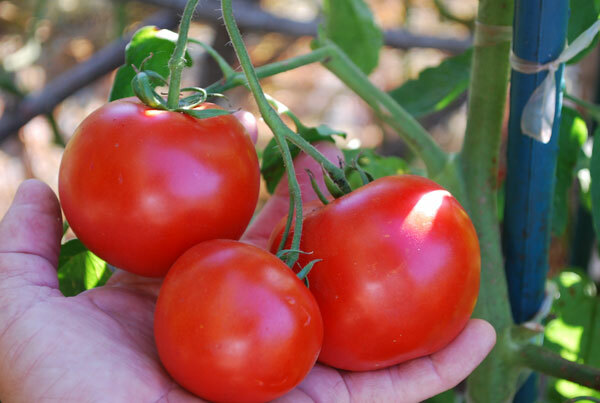 Producing like a champ in cool weather, resistant to frost, it is a splendid producer of big red, round and heart shaped, 5"- 6" fruits with great old-time intense tomato flavors and a juicy silken texture. Very heavy in the hand, weighing from 10 to about 16 ounces. One of the first varieties to produce, and continue bearing fruit well into November and December in the cooler coastal regions of Washington, Oregon and California, Sunset's Red Horizon will also produce beautifully and reliably in all climates and has proven resistant to frost, blossom end rot and cracking. Introduced to the west by Nik Peplenov who immigrated to the US in 1999 and brought with him his favorite heirloom seeds from the Rostov Don region of Russia, it was named by tomato grower Gary Ibsen in 2003 after Sunset Magazine. Sunset's Red Horizon is a spectacular, all-around champion tomato. The fruit in the photograph was picked in our garden on January 27th, 2007. Photograph by Gary Ibsen. Stupice ($6.25) F/C (EE) (pron: Stoo-PEETS-eh) 52 days. A great tomato! For me, this is the absolute very best tasting super-early cold-or-hot weather variety and among the first one I plant each season. Big flavor, sweet and luscious. Not a cherry tomato, Stupice is a 3 to 4 oz. red round fruit, bigger than a golf ball, smaller than a handball, the very first to ripen and very high yielding. Produces quickly, heavily, reliably early and continuously throughout the season. Even when fruits are smaller as the season wanes, they maintain their marvelous flavor becoming even sweeter with colder weather. A garden staple. Todd County Amish ($6.25) 82 days. (One of Laurel's new Favorites!) A genuine Amish family heirloom tomato. Last season I had a chat with my sweet friend Lisa Von Saunder of Amishland Seeds. I asked, "So, Lisa, what's the very best big Amish tomato? The most awesome flavored one -- I mean the one that makes your eyes roll into the back of your head?" She said, "Laurel, you have got to try Todd County Amish, it is incredible!" So I did; and she's right. Oh. My. God. We went crazy for them! Huge, beautiful, luscious, deep pink, 1 to 2 pound slightly fluted beefsteaks on potato leafed plants. Delicious, elaborate, sweet, rich, old time tomatoey flavors. Todd County Amish produces scads of fruit all season right up to frost. Unforgettable. When you bite into one of these you won't want to share it--but go ahead, it produces huge harvests. Lisa knows what she's talkin' about when it comes to things Amish. Yellow Submarine ($6.25) 70 days. (Ch) (E) Similar in appearance to Yellow Pear but with a deep, rich flavor and excellent texture, Yellow Submarine is replacing Yellow Pear for many gardeners who long for this beguiling shape and color but with big yummy tomatoey taste. Now the cutest little tomato also has great big flavor!